Place of Birth: Webster Groves, Greater St. Louis, Missouri, U.S.
Matt Bomer is an American actor, producer, director, and singer. Much of Matt’s ancestry is English. His maternal great-great-grandmother, Bessie L. Hocker, was of Swiss-German descent. Matt also has more distant Welsh, Scottish, Irish, Scots-Irish/Northern Irish, and German roots, as well as remote French ancestry (in the late 1500s). Matt is married to publicist Simon Halls, with whom he has three children. 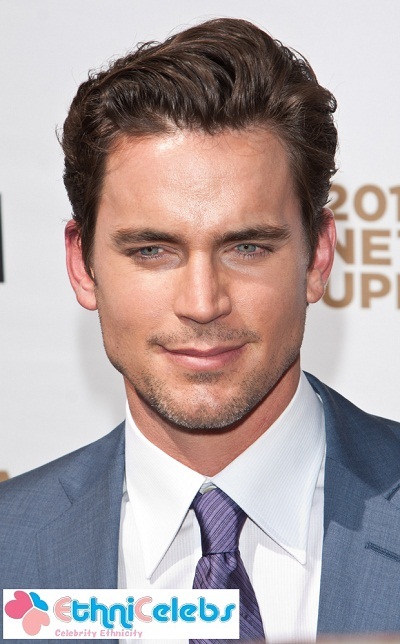 Matt’s Bomer line leads to a man named John Bomar, who was born, c. 1660, in Devonshire, England. Matt’s paternal grandfather was John O’Neill Bomer III (the son of John O’Neill Bomer, Jr. and Lamar Gertrude Ryals). Matt’s grandfather John was born in Tennessee. Matt’s great-grandfather John was the son of John O’Neill Bomer and Blanche Gates Anderson. Lamar was the daughter of John Bryan Ryals and Emma Lurene Mobley. Matt’s paternal grandmother is Mary Jane Moore (the daughter of James Rawlins Moore and Hannah Neal Hunter). Mary Jane was born in Tennessee. James was the son of Joseph Burney Moore and Martha Lee Coppedge. Hannah was the daughter of Samuel Thompson Hunter and Mary Frankie Edwards. Matt’s maternal grandfather was Victor Bruce Staton (the son of Victor Bryant Staton and Anne Elizabeth “Annie” Howard). Matt’s grandfather Victor was born in Virginia. Matt’s great-grandfather Victor was the son of Napoleon B. Staton and Pattie B. Harton. Anne was the daughter of William James Howard and Mary Elizabeth Riley. Matt’s maternal grandmother is Martha Alice Macy (the daughter of Ishmael Wilford Macy and Fanny/Fannie Elizabeth Heller). Martha was born in Indiana. Ishmael was the son of Edward Burton Macy and Bessie L. Hocker. Fanny was the daughter of John Hebert Heller and Martha Alice Peterson. According to IMDB, “Distant cousin of Justin Timberlake. Both share common descent from an Edward Bomer, who was born in 1690.” Not sure the exact relation there.